This is a constantly changing collection of glitzy and sparkly magnets and needle minders. Some are enameled, some only rhinestones, some have a combination of both. Each features a pair of super-strong rare earth magnets. You can simply display each where-ever you would a magnet, or separate the two magnetic pieces and attach your 'little pretty' to something that is not magentic -- like your needlework fabric! All different in size, some are an inch, some are two. Very heavy-duty, too. Designs and subjects come and go... most are limited in production... that part is a surprise! Accoutrement Designs has several VERY LIMITED EDITION jeweled magnets -- I am not sure how long they will be available -- so darn cute! Each very heavy-duty metal piece is jeweled and enameled with all the right bright colors to make your favorite little 'personality.' They all measure approx 2 inches in size, and feature a strong rare-earth magnet on their back (works on the fridge) along with another magnet to let you attach it to things that are not magnetic -- like your stitching fabric or your pattern. Use them as a needle minder, or stick them somewhere fun near your work area. Accoutrements warns that the magnets are super-strong and their fields can damage computer monitors, credit cards... all the normal things these neodymium magnets love to mess with! Very substantial and very FUN! Minnie, Mickey, and The Grinch... everybody recognizes these little guys! Again approx 2 x 2 in size, again the pair of powerful rare earth magnets on the backsides. We also have a couple of sports team magnets... these won't last long, either! Lots like these colorful little heads... this is a collection of 6 different colors... each magnet measures approx 1/2 x 3/4 of an inch in size. I don't know the actual process used to make them, but the design is sealed underneath a clear resin or something -- definitely smooth and sealed for life! Asst colors. 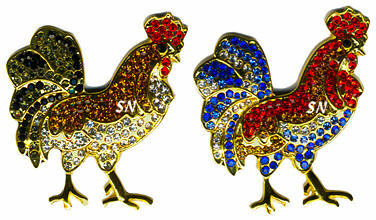 Accoutrements has two gorgeous jeweled magnetic rooster needle minders that I just had to have!!! 2 x 2 inches in size, one is blue, teal and red in color, the other is black, gold and crystal. I couldn't decide which one I liked better, so I got them both! Now it's your turn! You choose, or have us choose for you! These are always fun. and everyone always loves getting, giving, receiving and using these!!! Filled with colorful glass crystals, or enameled each is backed with one of those super-duper strong rare earth metal magnets. Clings to your needlework frame to hold your needles and scissors, but just as useful on the frige to hold notes - or your filing cabinet at work - or even medicine cabinet in the bathroom!! Think outside the box a little! All of them are about 1-1/2 inches in size. Well, Tis the Season!!!!! 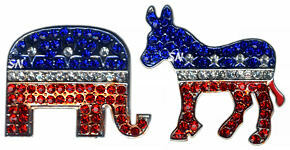 Just for fun, we have 'elegant' needle minder elephants and donkeys for all the Republicans and Democrats out there! Perfect to hold your needles, you can stick them on the filing cabinets at work... just where-ever a magnet would cling. Here are some new jeweled magnet minders by Accoutrements! Just something fun to have for your chart holder, refrigerator front -- or some other magnetic place -- Accoutrements jazzes up everything!!! This time around, we have a darling toad all in greens and gold, an elegant owl of black crystals, a brown hedgehog, firey red lobster, a yellow ducky, and even a 1 x 1-1/2 bar of leopard print! Each magnet is around an inch, studded with colorful crystals, and features a super-strong rare earth magnet. We even have a pair of styles -- round and square that feature a sticky area in the empty middle. Peel off the paper and attach some needlework, a small photo to personalize your magnet, or use it to hold a few beads while you attach them to your latest project!